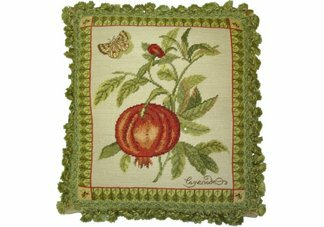 This lovely needlepoint throw pillow would make an excellent addition to your bedroom, living room or den! 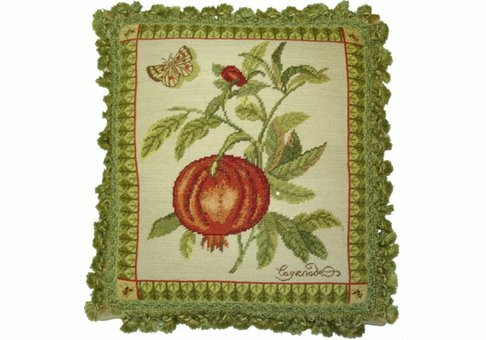 It features a beautiful butterfly hovering above a ripe pomegranate. This scene is surrounded by a detailed border featuring small insects in each corner and completed by a green tasseled trim. This decorative pillow is made with 100% wool thread and filled with 100% goose down. The back of the pillow is a solid coordinating color made with 100% velvet. Additional Information: 19" x 17"